Within these pages lurk Avadnu's most malevolent spawn. 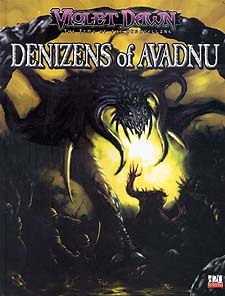 From insidious vylar to rampaging haklaa, from mighty autometals to nightmarish xxyth, the denizens of Avadnu are as unique as they are deadly. This tome presents more than 140 new creatures, templates, and monstrous prestige classes, 30 original skills and feats, and over a dozen weapons, spells, and magic items. Each creature is illustrated with lavish full-colour artwork, supplemented with adventure ideas, and designed for easy integration into any d20 system game. Separate entries elaborate on how creatures fit into Avadnu's history and ecology, providing depth to Violet Dawn campaigns.